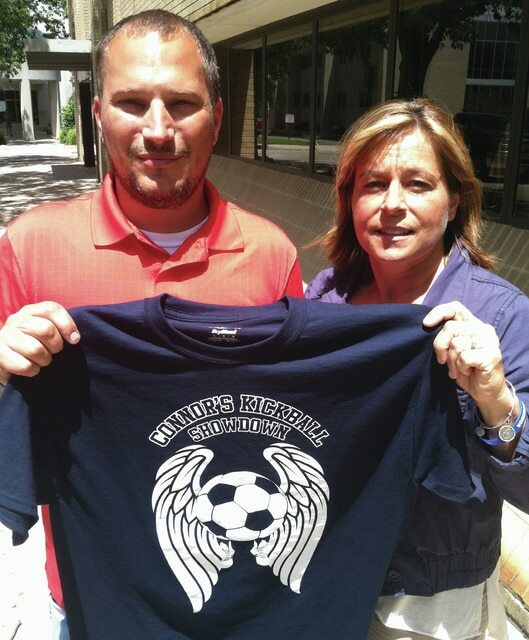 Jon and Theresa Wallace hold the shirt for the kickball fundraiser event scheduled for Sunday. XENIA — A charity group based in Jamestown is looking for community help in raising money to put on their fundraising event after Greene County officials declined to waive fees for the group Thursday. The event – Connor’s Kickball Showdown, scheduled for 2 p.m. Sunday, July 19 at Frank Seaman Park in Jamestown – was created last summer in memory of Connor Wallace, a Greeneview High School student who was killed in an ATV accident. Connor’s father, Jon Wallace, spoke at the board meeting, and said the event was originally created to honor his son’s legacy and give back to the community “that’s given back so much to us.” Wallace said a scholarship fund was created in his son’s memory, which resulted in three scholarships totaling $3,000 being awarded to students this year. “Connor’s Kickball Showdown was created as an opportunity to get the community together out of the house, to do something fun to help the people of the community deal with the tragedy that happened,” he said. Organizers decided to add to the event this year to raise money for the Connor James Wallace Scholarship Fund with a larger event, which is set to include the kickball tournament, a silent auction and a raffle. Wallace said 100 percent of the money raised would go to the scholarship fund. When the family decided to host the event at Frank Seaman Park – which is managed by Greene County Parks & Trails – they were told they would have to pay $600 to reserve the park’s baseball diamonds, Wallace said. At the meeting Thursday, Wallace asked county officials to reduce or waive the fees for the event. Commissioners declined to change or waive the fees for the event after listening to Wallace’s request. Wallace said that the diamonds were currently being managed by Jamestown Little League Baseball. Wallace said the group will raise the fee money through donations from businesses, and then out of money raised through the event if necessary. The Sunday event is free and open to the public. Those wanting to contribute to the fund can do so through Greene Giving, which manages the Connor James Wallace Scholarship Fund. Gifts should include a memo designating them for the fund. For more information on how to donate, visit greenegiving.org/givenow.html.